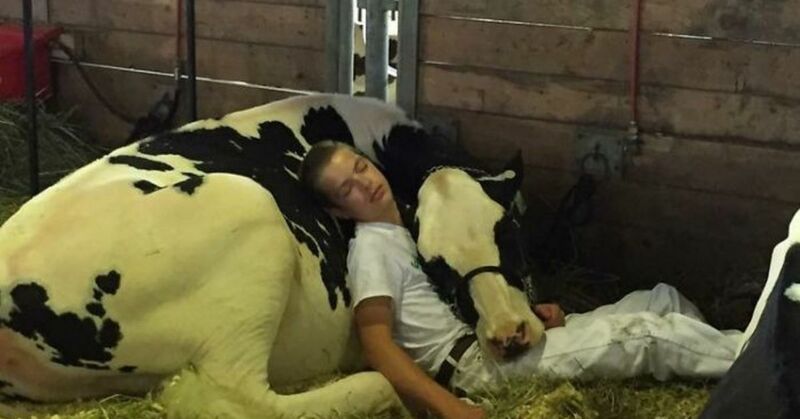 For two months, 15-year-old Mitchell Miner worked with and prepared his borrowed cow, Audri, for the youth dairy cattle show at the Iowa State Fair. 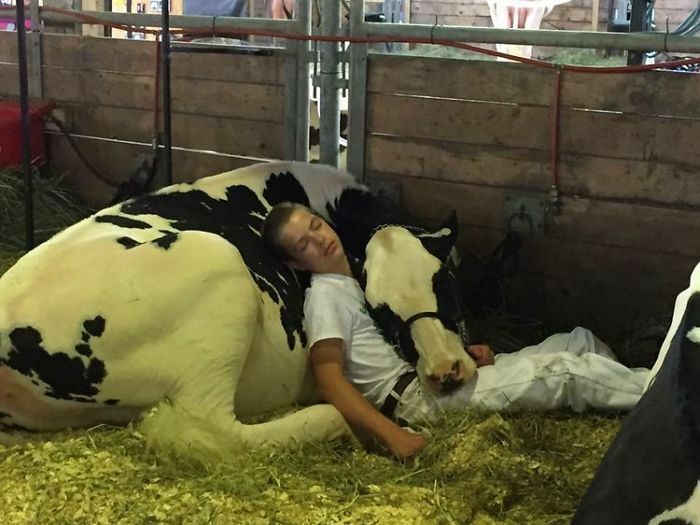 Their daily training and preparations created a strong bond between the boy and the cow. Practice included leading Audri as well as bathing, clipping and walking her many times until show day arrived. For the three days before the competition, Mitchell was up at 3 a.m. to care for Audri and get her ready. Finally, the day of the competition arrived, but despite their intense months of practice, Mitchell and Audri finished in fifth place out of seven competitors. Exhausted and sleepy, the boy and his cow headed back to the barn where they lay down in the straw for a nap. Mitchell's father, Jeremy, happened upon the two tired participants and quickly took a photo. 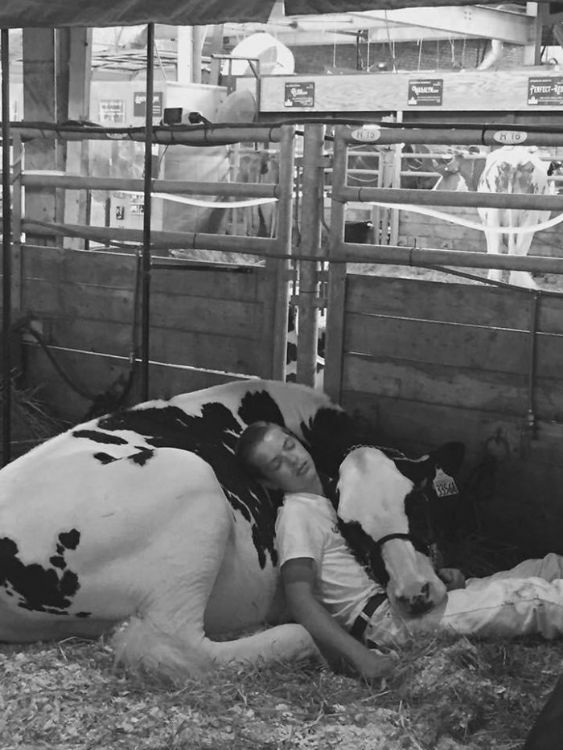 The photo captured Mitchell lying against Audri while the cow wrapped her neck around his body to doze off. "She likes to lay down quite a bit," Mitchell said. "I don't really understand the bond with my animal either. She just enjoys my company." When Mitchell's father posted the photo to Facebook later that day, it was a hit and quickly went viral, receiving 15,000 likes by the next afternoon. Mitchell comes from a farming family; his parents, Jeremy and Laura, grew up on farms themselves, and although they don't own a farm, the traditions, value, and hard work they learned while growing up on one have been passed down to their son. As for the photo, Laura is not surprised by how popular it has become and why it has resonated with so many people. She is also unsurprised by Audri's bond with her son: "I think it's just when you spend that much time with them, they get really comfortable with you," Laura said. 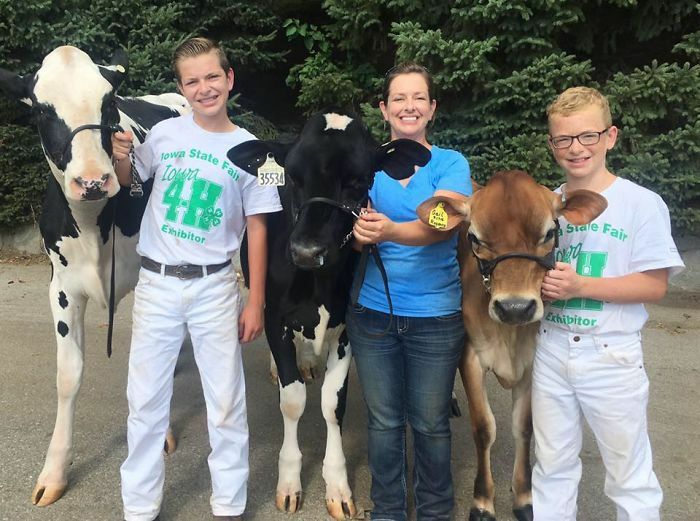 When she isn't competing in shows with Mitchell, Audri spends her time back on a dairy farm in Blairstown, Iowa, until the call comes from her good friend to get in the ring again.